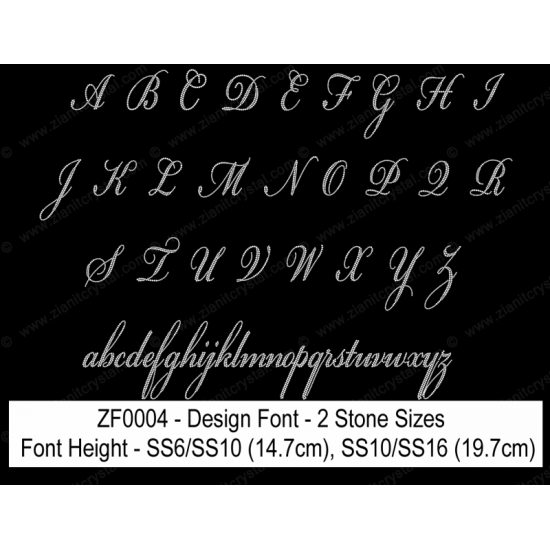 You may select ZF0004 rhinestone design font to make custom rhinestone design with us. The custome design could be your name, your company name or anything you couls ever imagine, we may make the template for you. You may use Swarovski, Preciosa and any other brands of Hotfix Crystals. The template designed to use either SS6 (~2mm)/SS10 (~3mm) or SS10 (~3mm)/SS16 (~4mm) hotfix crystals. The maximum font height will be different for a different hotfix crystals size, and the height is tabulated in the table below. If you need a template for a different hotfix crystal size, we can do it for you, just contact us.